Spinoni Italiani are gundogs with a thick and muscular profile. They have a square frame with their height and length being relatively equal. The chest is broad and well rounded. The head is long and oval shaped at the top, with gently sloping sides and a square muzzle. The mouth and eyes are framed by long and stiff hair, forming what resembles eyebrows, a tufted beard and mustache. Eyes are large and set fairly far apart. The tail is partially docked and the coat is one dense, wiry and crimped layer that provides enough protection to comfortably navigate a wide variety of terrain, including cold water. Spinoni come in white, orange, orange roan, brown roan and many combinations of two of those colors. They have a fast-trotting, extended gait, making it easy for them to cover long distances without tiring. Common Misspellings Spinoan Italiano, Spinone Italian or Spinoan Italiano. They are hardworking and courageous, but not especially aggressive. Spinoni are considered to be very practical dogs that learn fast, although they have a slow and steady style and can be stubborn. They require reasons behind the tasks asked of them. Some trainers have observed that this dog is very eager to retrieve dead birds, but hesitant to pick up training dummies. 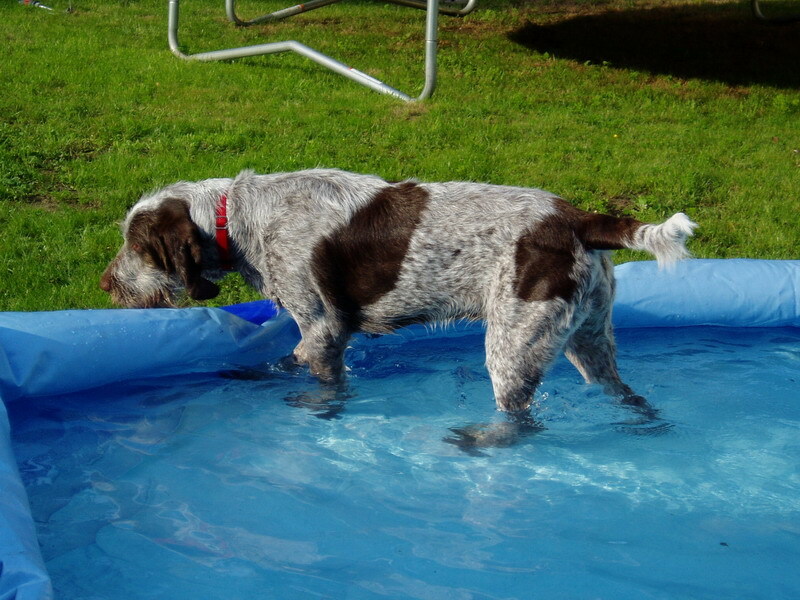 Spinoni are extremely friendly and playful, making them wonderful with people but not so wonderful as guard dogs. They are quiet, gentle and good with other animals and children. They are also very sensitive and can be timid if not properly socialized. They are comfortable in all kinds of weather, including sun and snow. They love water and are good swimmers. Secure fencing is important, as they capable of jumping over fences shorter than 5 feet and some will dig tunnels if the ground is soft enough. 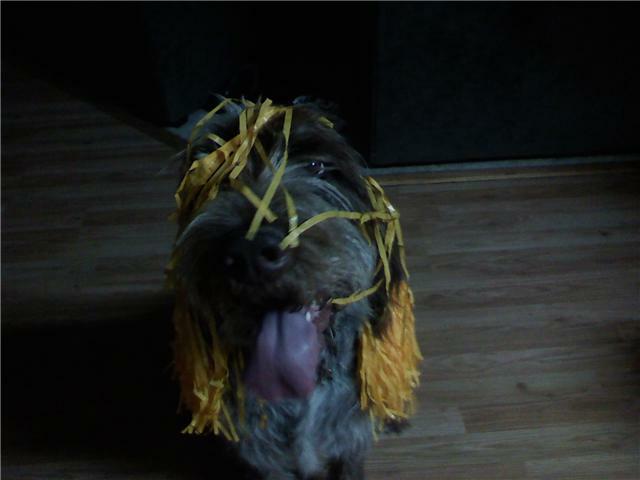 The Spinone Italiano is an endurance runner rather than a sprinter, which makes for a good jogging partner. Proper socialization in the first 4 to 10 months of life is extremely important to prevent fearfulness. Good company and companionship are essential for this social breed. Said to drool and smell more strongly than some dogs, Spinoni are still relatively easy to keep clean. Occasional stripping (pulling out dead hair) and weekly grooming are necessary to keep the coat in good condition. 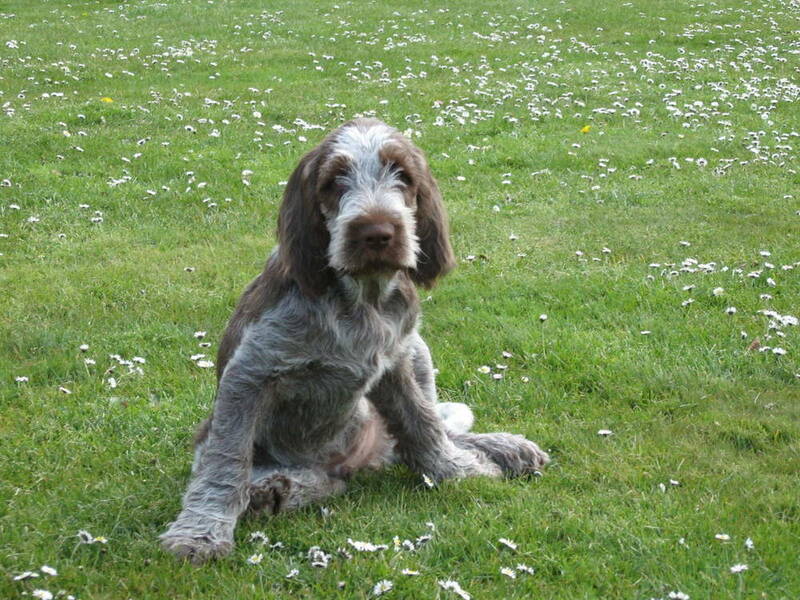 The Spinone Italiano may be susceptible to canine hip dysplasia, gastric torsion, otitis externa, entropion and cerebellar ataxia. 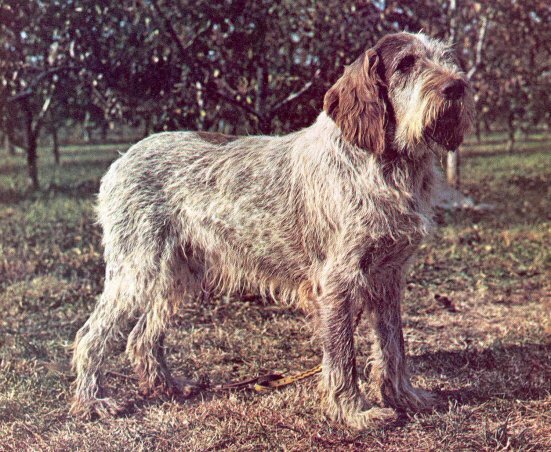 Records of bristly haired hunting dogs trace back as far as 500 BC, but we can only be certain that the Spinone Italiano has been around since the 13th century. 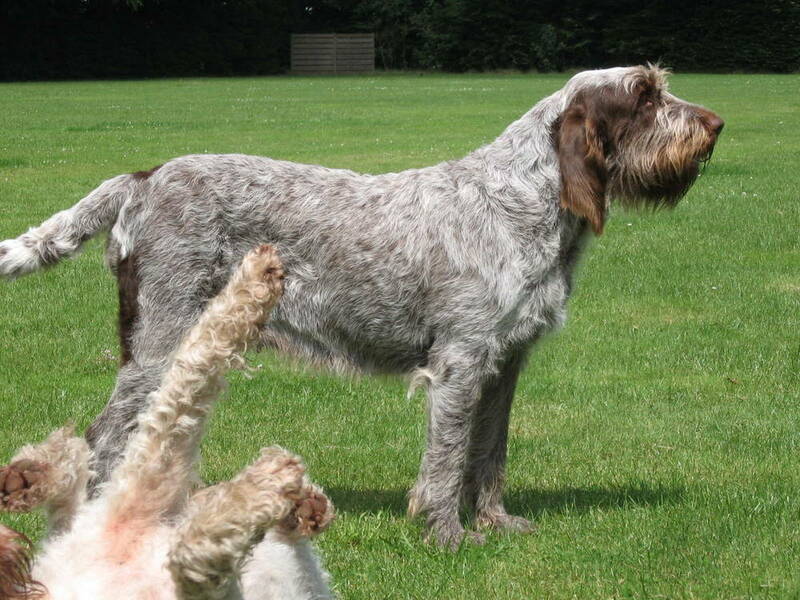 Renaissance paintings indicate that wire haired pointers had a strong presence in Italy in the 15th and 16th century. 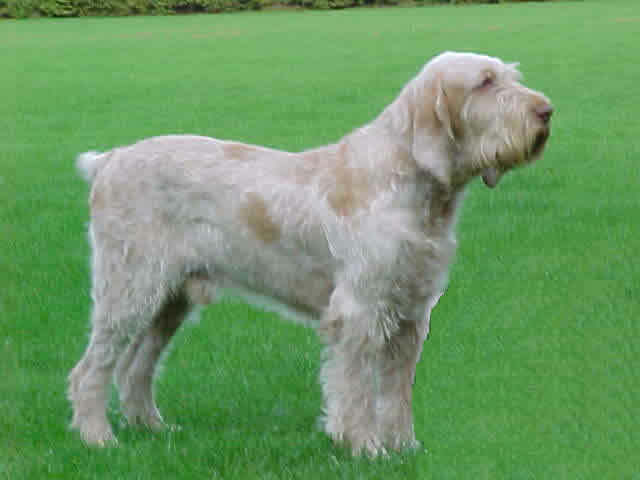 The Spinone Italiano is an Italian setter cross, bred perhaps to White Mastiffs or French Griffons. 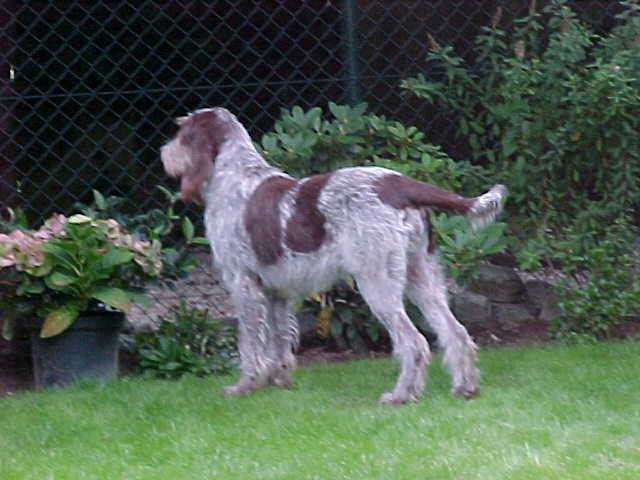 The Spinoni's traits are said not to have changed much from those of their ancestors; their fast trot and excellent sense of smell have remained intact for centuries.The Spinone Italiano was a fairly well used hunting dog for hundreds of years, but by the beginning of the 20th century its popularity had waned. World War II was also unkind to the Spinone, and by 1950 the breed was nearly extinct. During the 1950s a dedicated group of hunters set out to restore the breed to its former glory. 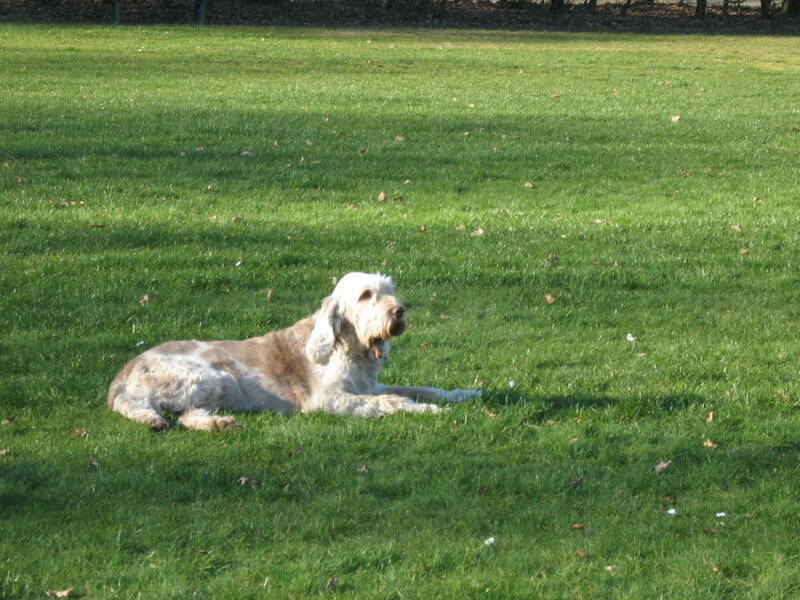 These efforts were successful, and today the Spinone Italiano is a popular pet in much of Europe. 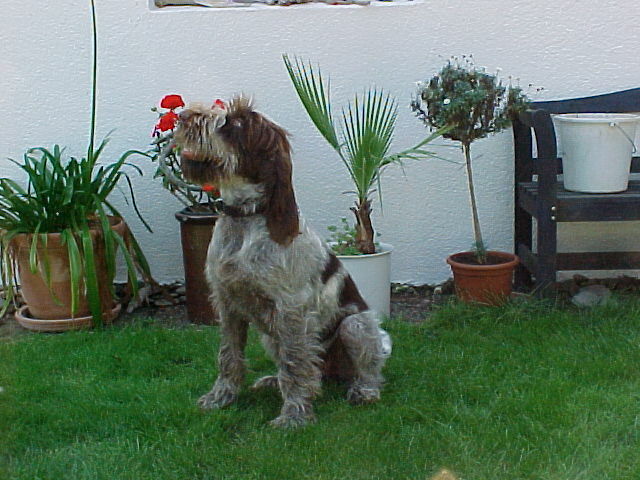 The breed was recognized by the American Kennel Club in 2000, though it has yet to gain much of a foothold in America.The Spinone Italiano is named for an Italian thorn bush called the pino because with its thick, tough skin the Spinone Italiano was particularly adept at hunting in these bushes.